WASHINGTON (AP) — After she steps down in February, Janet Yellen will go into history books at the first woman to have led the Federal Reserve in its 100-year history. But Yellen, who has earned widespread praise for her stewardship of the Fed, will be remembered for much more than breaking a glass ceiling at the world’s leading central bank. Before becoming the Fed chair in 2014, Yellen served six years as president of the Fed’s San Francisco regional bank and then as vice chair during Ben Bernanke’s second term as Fed chairman from 2010 to 2014. Yellen was among the first Fed officials to recognize the gravity of the risk posed by the subprime mortgage crisis and to grasp the severity of the Great Recession — the worst downturn since the Great Depression of the 1930s. Transcripts of the Fed’s policy meetings during the fall of 2008, when Lehman Brothers’ collapse ignited the scariest phase of the financial crisis and deepened the recession, show that Yellen was a leading advocate for aggressively slashing interest rates to help buttress the financial system and support the economy. As the recession deepened and millions lost jobs, Yellen was also a vigorous supporter of Bernanke’s drive to take emergency actions that the Fed had never before attempted. With the Fed’s benchmark rate already at a record low near zero, Bernanke, with Yellen’s backing, turned to buying Treasury and mortgage bonds to further drive down long-term borrowing rates. The bond purchases swelled the Fed’s balance sheet five-fold to $4.5 trillion and raised alarms among critics. But the lower rates helped the job market heal and the economy recover. By the time Yellen took over as Fed chair in February 2014, the recession had ended and the economy had entered its fifth year of expansion. Yet the pace of growth remained anemic. And the job market had yet to recover all of the 9 million jobs that had vanished during the recession. So Yellen proceeded to guide the Fed to maintain an aggressively stimulative policy, with record-low rates and bond purchases that were intended to hold down long-term loan rates. Some critics, inside and outside the central bank, warned that the Yellen Fed was setting the stage for runaway inflation or dangerous asset bubbles. But Yellen’s approach carried the day. She argued that the frailty of the economy justified maintaining ultra-low borrowing rates. The Fed kept its benchmark rate near zero until December 2015. Since then, it has raised its rate just four times, each time slightly. In December, economists expect the Fed to raise its benchmark rate again And in October, it began paring its balance sheet with initial small monthly reductions. Thus far, Yellen’s gamble that the Fed could leave rates at low levels for years longer than some had thought has paid off. The unemployment rate, which peaked at 10 percent in 2009, is now just 4.1 percent — the lowest point since Bill Clinton was president in 2000. Jerome Powell, the Fed board member whom President Donald Trump tapped to succeed Yellen, is expected to extend Yellen’s policies of gradual modest increases in rates and slight reductions in the Fed’s bond holdings. Yellen’s belief that rates could stay at record lows because inflation posed no immediate threat has so far proved a winning formula. Inflation, in fact, has stayed chronically too low — below even the Fed’s 2 percent target. And the Fed is forecasting that annual inflation won’t reach 2 percent before 2019. Some of Yellen’s critics, including conservative Republicans in Congress, remain unbowed. That assert that by refusing to move earlier to normalize Fed rates to shrink the Fed’s bond holdings, Yellen might have elevated the risk of future high inflation or of dangerous bubbles that could form in stocks or other assets. These critics say they fear that a worsening inflation picture might then compel the Fed to raise rates so quickly as to tip the economy into a recession. Yellen has to hope that future economic trends are kinder to her than they were to one of her predecessors, Alan Greenspan. When he stepped down as Fed chairman in early 2006 after nearly two decades, Greenspan was being hailed as the “maestro” for having skillfully managed the economy. But by the next year, the first tremors from the subprime mortgage crisis were being felt. And by 2008, the economy was enduring a painful recession and its worst financial crisis in seven decades. Greenspan’s reputation as an astute economic manager suffered a severe blow. Yellen can, if she chooses, stick around to help shape Fed policies after her term as chair ends on Feb. 3. Her separate term on the seven-member Fed board runs until Jan. 31, 2024. Marriner Eccles, the legendary Fed chairman whose name adorns the central bank’s headquarters building in Washington, is the only chairman to have remained on the board after serving as chairman. Yellen could broaden her place in history if she became the second person to remain on the Fed’s board after stepping down as its leader. 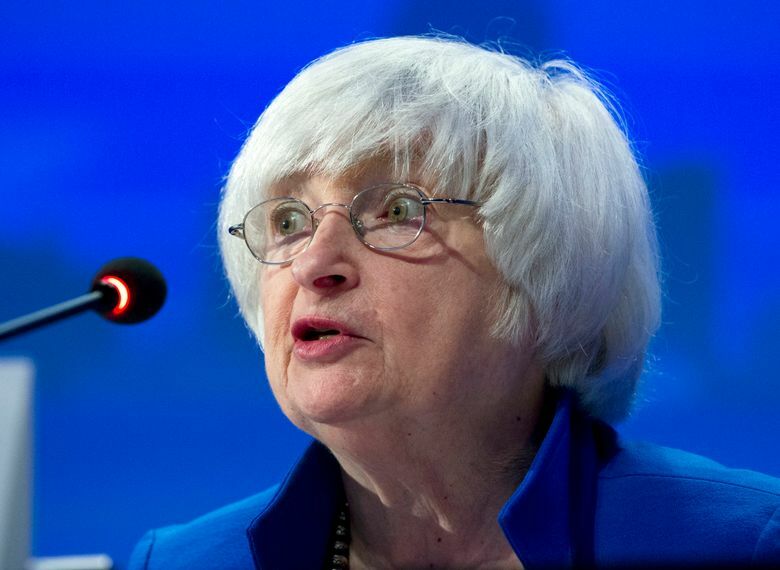 So far, she has been mum about her plans once her term as Fed chair ends.